Bwindi Impenetrable National Park Hotels – Bwindi Impenetrable National Park accommodation. Bwindi Impenetrable National Park accommodation / hotels in the four regions of Bwindi Impenetrable National Park namely; Buhoma, Ruhija, Rushaga and Nkuringo have got a range of accommodation options in different categories of luxury/Upmarket to Midrange/Standard and Budget/Basic that provide overnight stay to Uganda safari undertakers. The Clouds Mountain gorilla lodge is a topnotch accommodation facility perched on the top of Nkuringo hill overlooking the impenetrable forest on one side and Virunga volcanoes on the other side. The lodge is a community establishment that was built with a hand from African Wildlife Foundation and is currently by wild places a re-known hospitality group. The lodge has impressive and lush architecture and décor. The lounge is very spacious while the bar and a restaurant have the modern touch. The fire place is available at the public area and in the rooms while the Spa and Wi-Fi are also available. This is located on a raised altitude of 2,161m above sea level at the Nteko ridge with views of Bwindi Impenetrable forest, Kashasha river valley and the Virunga volcanoes. The restaurant serves the locally grown organic food with opportunity to do self-catering. The accommodation is offered two (2) self-contained cottages, five (5) twin rooms with shared ablutions, one (1) twin banda, safari tents and own camping. The Nkuringo gorilla camp provides a perfect base for trekking Nkuringo gorilla group. The Camp features Lighting is done with the help of paraffin lanterns while shared bathrooms include; two (2) bush showers and two (2) eco toilets. Guests can request for hot water for bathing. Nshongi Camp is positioned with in the region of Rushaga and has four (4) traditional bandas along with a restaurant that has the capacity of serving three course meals. The evening camp fire is available. Positioned on the shores of Lake Mutanda, Chameleon Hill lodge is an upmarket accommodation facility that can be used to trek gorillas in the southern sector of Rushaga.the lode has stunning views of the Virunga Volcanoes and the lava dammed lake Mutanda. It has 10 luxury chalets ach with distinct form which qualifies it to have the name chameleon. 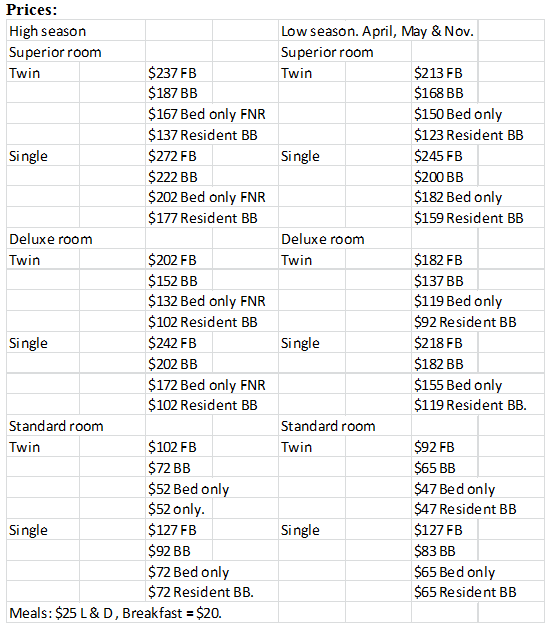 There are 5 twin rooms and 5 permanent Queen Bed rooms. The rooms are self-contained, have great décor and mosquito nets. The lodge also has a lounge and a fire place not forgetting the 20 people seat capacity restaurant. Ruhija Gorilla Safari Lodge is positioned in the region of Ruhija in the east of Bwindi Impenetrable National Pak. It offers luxury accommodation in self-contained cottages equipped with a fire place and hot and cold running water. The lodge has dinning, internet (Wi-Fi), bar, DSTV, gift shop, wine cellar and mini library. There are 4 superior cabins taking up to 8 people, 4 deluxe cabins taking up to 8 people and 6 standard cabins taking up to 12 people. This is a community establishment set up by residents of Katojo Parish in the months of July 2008 as an alternative source of livelihood that would prevent them from encroaching on the forest resources and this contribute to conservation. The lodge is a budget establishment and is located at 500m from the gorilla trekking assembly point. It features safari tents, bar and restaurant with the views of the narrow valley. The Ruhija Gorilla Mist Camp is located within Ruhija region and is a midrange accommodation establishment containing 4 thatched cottages with private decks that have the views of the valley and the forest. The lodge is approximately 5 minutes’ drive from the gorilla trekking starting point. The rooms are self-contained with bath tubs and cozy bedding. There is a public area has a lounge, bar and restaurant in various sections. It also features a laundry, meeting rooms and a Wi-Fi. Positioned on the top of the hill adjacent to Gorilla Mist Camp, Trekkers Tavern has rewarding views of the community lands and the impenetrable forest. It has 5 cottages well-spaced and self-contained. Gift of Nature Lodge is situated in Mburameizi, Ruhija Sub-County in the district of Kabale and it contains beautiful gardens, rooms with single and double/twin bedding arrangement. The lodge features a wide screen TV. The rest camp is a community run enterprise and is focused on improving people’s livelihood through gorilla tourism. It is positioned close to the Institute of Tropical Forest Conservation. It has 4 self-contained cottages with double beds, 2 cottages with twin beds and 2 general campsites for self-camping. The Eco Marvels Gorilla Resort is located at the boundary of the park in the region of Ruhija and has accommodation set in bandas and camping. Rooms stretch from deluxe to double and family arrangement. The restaurant and internet connection are available. Broadbill Forest Camp is positioned in Ruhija and is named after the endemic bird species Broad bill which is traced only in Ruhija and Democratic Republic of Congo. It is approximately 20 minutes’ drive from the gorilla trekking assembly point in Ruhija. It has 4 twin cabins lit by solar or lantern if the sun is not enough. 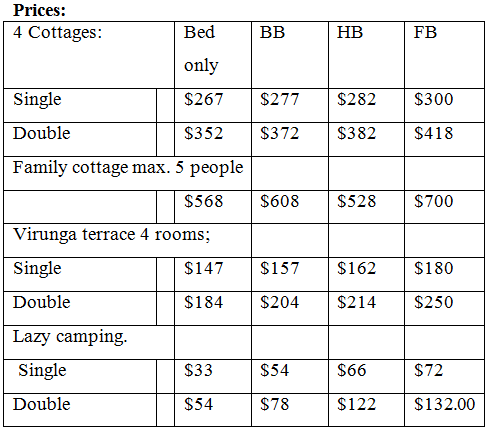 This is a budget accommodation arrangement in Rubuguri which can be used to track gorilla groups of Rushaga or Nkuringo. It has 2 self-contained bandas with 2 twin rooms, 2 self-contained tents featuring double beds, 4 single rooms with shared ablutions and a camping ground. The rooms feature electricity while the beds are made from the local materials which give an eco-touch while on your gorilla safari tour in Uganda. The Sanctuary Gorilla Forest Camp is located close to Buhoma gate entrance and offers top-notch luxury accommodation for Uganda gorilla safari undertakers. It has 8 tents that are self-contained with wider terraces that offer impressive views of the Impenetrable forest. Located in Buhoma region outside the park boarders, Volcanoes Safaris Bwindi lodge overlooks a flowing river and has a raised altitudinal landscape where guests enjoy the impressive views of the forest. The accommodation is provided in 8 bandas with private terraces that offers great forest views. The rooms are classy with eco-décor suiting your Uganda safari interests. The lodge also has a fire side bar and a lounge bringing great relaxation experience. 8 Bandas with five twins and 3 doubles crafted out of timber and stones. Self-contained rooms with running hot and cold water. Gorilla Resort is situated in Buhoma region and has tented accommodation perched on wooden platforms with good views of Bwindi Impenetrable forest. Mahogany Springs Camp is located outside the park close to the b entrance and offers a luxury accommodation to Uganda gorilla safari undertakers. It overlooks the flowing Munyange River and its designed using traditional materials. The lodge has 8 stone cottages that are well furnished with private veranda that offers impressive views of the forest. The rooms feature mosquito nets, enough space, inbuilt washrooms and an open terracotta shower. It also has a public area where a fire place, library and a gift shop are found. The restaurant and bar are modern while the weekly barbeque night is available. Lake Kitandara Bwindi Camp is located in Buhoma region and offers mid-range accommodation. It is crafted in a traditional setting using local materials with modern facilities. Lake Kitandara Bwindi Camp has 20 self-contained tents which are named after the birds of Uganda. The rooms feature washrooms, 24 hour solar electricity and cozy beds. The Engagi lodge in Buhoma region of Bwindi Impenetrable National Park is positioned outside the park boundaries and has 8 self-contained cottages surrounded by a lush vegetation cover and with enough space. The Engagi is a local name for the endangered mountain gorillas. The lodge was crafted by local craftsmanship using local materials. It features a dinning, veranda and bar not forgetting its kitchen that has the capacity of preparing three course meals. The rooms have inbuilt washrooms featuring cold and hot running water. It also has solar powered electricity and a parking space. Located in the Buhoma region outside the park boundaries 2km from the entrance, CTPH Gorilla Conservation Camp is a budget establishment that caters for majorly researchers and students though leisure travelers are welcome. The profits generated from the camp are dedicated to conservation of mountain gorillas. Initially, the camp was called Kimbla-Mantana at the onset of gorilla tourism in 1993 and CTPH took it over in the year 2008. 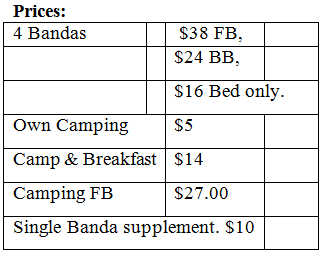 It has 3 tents with 2 single 2 single beds and provision for camping. There is a gorilla research clinic at the station and the Batwa community is within a close range. Bwindi Guesthouse offers accommodation in two houses that is the Gorilla house and Monkey house. The main guesthouse is positioned close to Buhoma community hospital and it features a kitchen, outdoor gazebo, living room, dining, library and a porch. The rooms feature cold and hot running water with en suite wash rooms, beds with mosquito nets while the area has internet and electricity. Bwindi View Bandas is a budget accommodation in Buhoma region close to the park entrance. It has simple Bandas with single, double/twin and triple rooms and camping provision. The dinning is lantern lit at night. Positioned close to the entrance of Bwindi Impenetrable National Park, Buhoma community camp offers budget/ basic accommodation for travelers on Uganda gorilla safari tour. Buhoma Community Rest Camp has got traditional Bandas with an eco-setting. The Bandas feature private Verandas with impressive views of the impenetrable forest. The rest Camp also feature self-contained tents, leveled terraces for camping and dormitory style accommodation. Buhoma Community Rest Camp has 6 self-contained safari tents, 2 self-contained cottages, 5 non self-contained twin cottage bandas, 6 bed capacity dormitory and camping provision. Shower facilities with hot & cold water. Positioned in Buhoma sector on a hill top bordering the Bwindi Impenetrable National Park, Silverback lodge is a mid-range establishment. It has 7 rooms with an African décor. It has a lounge with impressive views of the impenetrable forest along with a restaurant and a bar. Silverback lodge also has a nice garden where guests can relax and memorize the gorilla trekking experience. Open lounge with views of the impenetrable forest. The Nyundo Valley Hill Bandas are located in Nyundo village about 6km from the Buhoma park entrance. The bandas are crafted in traditional materials with comfort and impressive views of the impenetrable forest. It has 5 bandas each with a mosquito net and shared washrooms that have cold and hot running water. The meals are derived from the locally grown organic food stuffs and are prepared by local women with expertise in cooking. Copyright © 2019 | Bwindi Impenetrable Forest National Park Uganda | Powered by Prime Safaris & Tours Ltd.